This book is extremely long (over 16k kindle pages) and I struggled with a quick summary, so hopefully you won't mind that I used Amazon's! 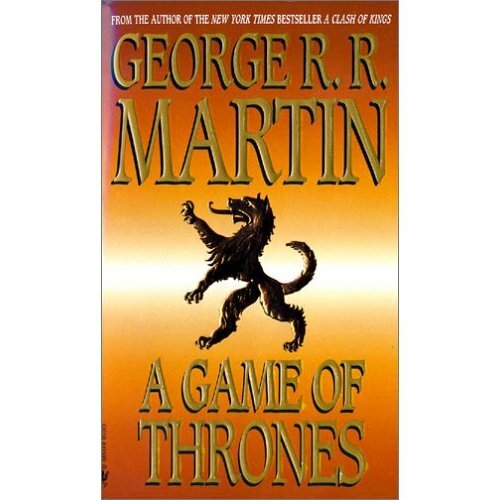 I watched GOT season 1 on HBO this past year and loved the show, so I decided to give the book a try. To the producers and writers credit, the show is almost an exact replica of the book. Unfortunately, that made reading the book rather tedious as I knew what was going to happen. There was additional detail and background information on characters that the show didn't delve into, but the show and book pretty much mirror each other. Overall-I love that GOT is a fantasy world but still has a strong old world England feel to it. Martin writes each chapter from a different characters perspective which is a narrative I personally enjoy. I am 60% through the second book and LOVE it (because the plot is a mystery to me, I enjoy the events unfolding and trying to guess what is going to happen). If you are a fan of the show, you may want to skip book 1 and start with the second book. If you are someone that enjoys fantasy (realize this reads more like old England with a hint of magical type elements) you will probably enjoy this.